Branches should not exceed 4 inches in diameter. Branches should be kept at their original length and not cut into smaller pieces. Branch piles should be set out near the edge of the road away from mailboxes or other obstructions. Piles should be set out no earlier than the Saturday before collection day (72 hours). Piles set out too early or late can be tagged with a notice indicating the resident has 48 hours to remove the items. Tags will be noted with the date and time that they were placed. If branches are not removed within 48 hours as stated on the tag, a special collection will be arranged with Johns Disposal and the resident will be charged. Up to 15 minutes will be spent per property on collecting and chipping. Any piles that exceed this time will be tagged and the owner will have the option to remove the piles or have them collected for a fee. 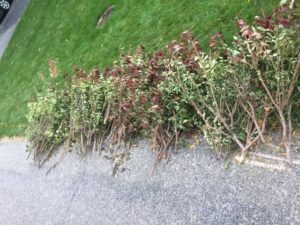 In the event of significant, widespread storm damage in the Village, the Village President or Village Administrator may declare an emergency storm-related branch collection. An announcement of a storm-related branch collection would be made on the Village website and in a special e-mail alert to individuals who are signed up to receive E-News.